Human reason may, of itself, come to the knowledge of the existence of God as Creator of all beings; it may, by its own innate power, form to itself an idea of His perfections by the study of His works; but the knowledge of God's intimate Being can come to us only by means of His own gracious revelation. It was God's good-pleasure to make known to us His essence, in order to bring us into closer union with Himself, and to prepare us, in some way, for that face-to-face vision of Himself which He intends to give us in eternity. But His revelation is gradual: He takes mankind from brightness unto brightness, fitting it for the full knowledge and adoration of "Unity in Trinity, and Trinity in Unity. During the period preceding the Incarnation of the eternal Word, God seemed intent on inculcating the idea of His Unity, for polytheism was the infectious error of mankind; and every notion of there being a spiritual and sole cause of all things would have been effaced from the earth, had not the infinite goodness of God watched over its preservation. Not that the old Testament Books were altogether silent on the three divine Persons, whose ineffable relations are eternal; only, the mysterious passages, which spoke of them, were not understood by the people at large; whereas, in the Christian Church, a child of seven will answer those who ask him, that, in God, the three divine Persons have but one and the same Nature, but one and the same Divinity. When the Book of Genesis tells us that God spoke in the plural, and said: 'Let Us make man to Our image and likeness, the Jew bows down and believes, but he understands not the sacred text; the Christian, on the contrary, who has been enlightened by the complete revelation of God, sees, under this expression, the three Persons acting together in the formation of man; the light of faith develops the great truth to him, and tells him that, within himself, there is a likeness to the blessed Three in One. Power, understanding, and will, are three faculties within him, and yet he himself is but one being. In the Books of Proverbs, Wisdom, and Ecclesiastics, Solomon speaks, in sublime language, of Him. who is eternal Wisdom; he tells usand he uses every variety of grandest expression to tell usof the divine essence of this Wisdom, and of His being a distinct Person in the Godhead; but how few among the people of Israel could see through the veil! Isaias heard the voice of the Seraphim, as they stood around God's throne; he heard them singing in alternate choirs, and with a joy intense because eternal, this hymn: 'Holy! Holy! Holy! is the Lord! But who will explain to men this triple Sanctus, of which the echo is heard here below, when we mortals give praise to our Creator? So, again, in the Psalms, and the prophetic Books, a flash of light will break suddenly upon us; a brightness of some mysterious Three will dazzle us; but it passes away, and obscurity returns seemingly all the more palpable; we have but the sentiment of the divine Unity deeply impressed on our inmost soul, and we adore the Incomprehensible, the sovereign Being. The world had to wait for the fullness of time to be completed; and then, God would send into this world His only Son, begotten of Him from all eternity. This His most merciful purpose has been carried out, and the Word made Flesh hath dwelt among us. By seeing His glory, the glory of the only-begotten Son of the Father, we have come to know that, in God, there is Father and Son. The Son's mission to our earth, by the very revelation it gave us of Himself, taught us that God is eternally Father, for whatsoever is in God is eternal. But for this merciful revelation, which is an anticipation of the light awaiting us in the next life, our knowledge of God would have been too imperfect. It was fitting that there should be some proportion between the light of faith, and that of the vision reserved for the future; it was not enough for man to know that God is One. So that, we now know the Father, from whom comes, as the apostle tells us, all paternity, even on earth. We know Him not only as the creative power, which has produced every being outside Himself; but, guided as it is by faith, our soul's eye respectfully penetrates into the very essence of the Godhead, and there beholds the Father begetting a Son like unto Himself. But, in order to teach us the mystery, that Son came down upon our earth. He Himself has told us expressly that no one knoweth the Father, but the Son, and he to whom it shall please the Son to reveal Him. Glory, then, be to the Son, who has vouchsafed to show us the Father I and glory to the Father, whom the Son hath revealed unto us! The intimate knowledge of God has come to us by the Son, whom the Father, in His love, has given to us. And this Son of God, who, in order to raise up our minds even to His own divine Nature, has clad Himself, by His Incarnation, with our human nature, has taught us that He and His Father are one; that They are one and the same Essence, in distinction of Persons. One begets, the Other is begotten; the One is named Power; the Other, Wisdom, or Intelligence. The Power cannot be without the Intelligence, nor the Intelligence without the Power, in the sovereignly perfect Being: but, both the One and the Other produce a third Term. The sacred liturgy, whose object is the glorification of God and the commemoration of His works, follows, each year, the sublime phases of these manifestations, whereby the sovereign Lord has made known His whole self to mortals. Under the sombre colours of Advent, we commemorated the period of expectation, during which the radiant Trinity sent forth but few of Its rays to mankind. The world, during those four thousand years, was praying heaven for a Liberator, a Messiah; and God's own Son was to be this Liberator, this Messiah. That we might have the full knowledge of the prophecies which foretold Him, it was necessary that He Himself should actually come: a Child was born unto us, and then we had the key to the Scriptures. When we adored that Son, we adored also the Father, who sent Him to us in the Flesh, and with whom He is consubstantial. This Word of life, whom we have seen, whom we have heard, whom our hands have handled' in the Humanity which He deigned to assume, has proved Himself to be truly a Person, a Person distinct from the Father, for One sends, and the Other is sent. In this second divine Person, we have found our Mediator, who has reunited the creation to its Creator; we have found the Redeemer of our sins, the Light of our souls, the Spouse we had so long desired. Having passed through the mysteries which He Himself wrought, we next celebrated the descent of the holy Spirit, who had been announced as coming to perfect the work of the Son of God. We adored Him, and acknowledged Him to be distinct from the Father and the Son, who had sent Him to us with the mission of abiding with us. He manifested Himself by divine operations which are peculiarly His own, and were the object of His coming. He is the soul of the Church ; He keeps her in the truth taught her by the Son. He is the source, the principle of the sanctification of our souls; and in them He wishes to make His dwelling. 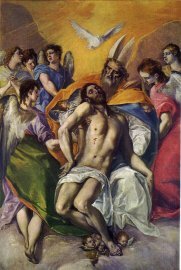 In a word, the mystery of the Trinity has become to us, not only a dogma made known to our mind by revelation, but, moreover, a practical truth given to as by the unheard-of munificence of the three divine Persons: the Father, who has adopted us; the Son, whose brethren and joint-heirs we are; and the Holy Ghost, who governs us, and dwells within us.